At midday, we were finally on our way out of Cairns. We'd enjoyed our stay here but three weeks is enough - time to move on and explore more of this big country. We headed south, passing Walsh's pyramid - a mountain where a local race is held every year. Half of it is run on flat ground and the other half, up the mount and all the way back to the start again. At these warm temperatures, you've got to be kidding! Our journey took us along the Gillies Highway and through the Tablelands, a beautiful mountainous-rainforest region. The highway has a lot of bends in it (236 in total). All these twists and turns took us high up into the mountains. The contrast of the mountainous-rainforest and areas of low-lying land looked great from here. We really noticed the altitude as our ears popped a few times on the ascent (we'd driven up to almost 800 ft). At this height, it felt a lot cooler with a nice gentle cross-wind blowing in through the windows. Definitely welcomed after the stifling temperatures in Cairns. Once we'd found a place to stay for the night in Yungaburra, we headed out to explore before it got too dark. Lake Eacham, a volcanic crater lake, was only 5-minutes drive from Yungaburra. The sun was out and a lot of people were swimming in the lake. The lake is an oval shape and trees outline the water, giving it a thick dark green border. Apparently, turtles can be found in this lake, as well as fish that spit water at low-flying insects (the fish shoot them down and eat them) and water dragons (harmless lizards). Ian took a dip in the lake, while I went for a short walk in the rainforest. Ian spotted the water-spitting fish, but no turtles. I only spotted a chook in the rainforest. We were told later on that we should have thrown some stones into the water - the turtles are more likely to come up to surface if they think there's food on offer! In the evening, we joined Francis, the guy from the hostel, on a platypus-spotting mission. Ten of us crammed into his van and we went over to Lake Tineroo - well, what's left of it anyway. The lake is suffering from drought - it is only 20 percent of its usual capacity and is some 13 metres lower than its usual depth. According to Francis, after the Tineroo dam was built, the lake engulfed a village, called Collara. Recently, due to the drought, parts of the old cricket grounds have reappeared from the water. Apparently, the village old boys all met up for a small reunion party and cracked open a few tinnies together on the pitch. I bet they didn't think they'd see it again! Unfortunately, we didn't see any platypus. Elusive creatures! According to Francis, only 2 percent of Australians have seen a platypus in its natural habitat - we were not going to add to any 'platypus-spotted' statistic today! 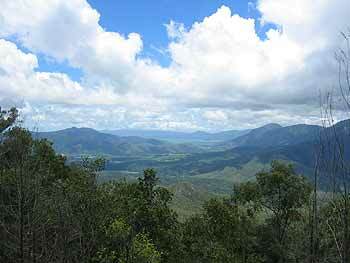 View from Heales Lookout, near Yungaburra.